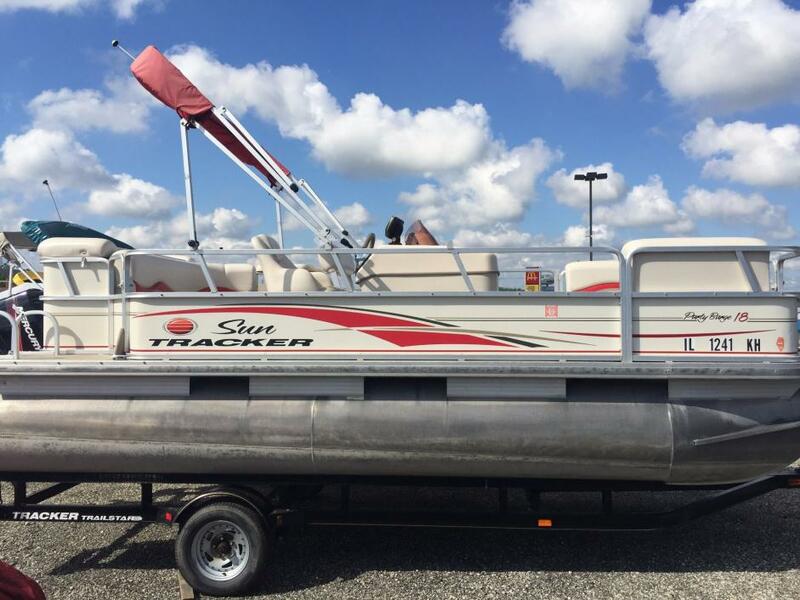 2009 Sun Tracker PARTY BARGE 18 Signature Series SOLD! 2009 Sun Tracker Party Barge 18 This is a 2009 Sun Tracker 18 that is powered by a Minn Kota E-Drive 48 Volt Electric Outboard. This boat includes 4 Deep Cycle Batteries, Stereo, 4 Bank Onboard Charger, and Playpen Cover. 2005 Sun Tracker PARTY BARGE 18 Signature Series The PARTY BARGE 18 Signature Series is clearly one of the best pontoon values ever to cruise down a river. 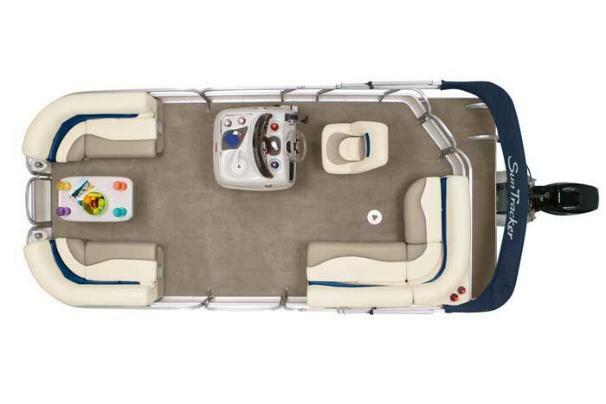 Although only 18-feet long, there's plenty of room aboard for family and friends, thanks to an extended motor pod design that greatly increases the useable deck space. There are also plenty of luxurious little extras, like plush lounges, a color-keyed Bimini top, built-in cooler storage, and an AM/FM/CD sound system. 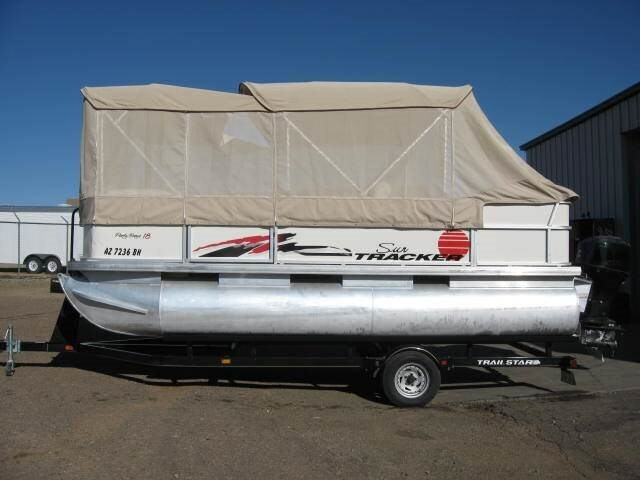 Of course, there"s the famous SUN TRACKER Boats attention to quality construction that you"ll see in things like the all aluminum transom and multi-chambered 24-inch pontoons. So don't let the affordable price mislead you, the PARTY BARGE 18 is a SUN TRACKER Boat through and through. This one is equipped with a full screen enclosure and a Mercury 60 HP Big Foot Four Stroke power upgrade! 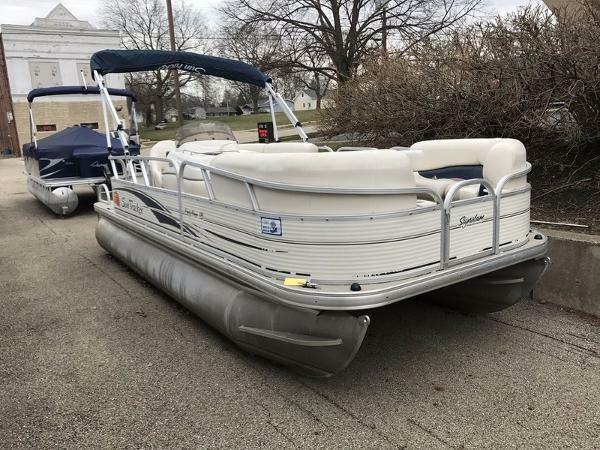 2006 Sun Tracker PARTY BARGE 18 Signature Series Feature for feature, inch for inch, you won't find another 18-foot outboard pontoon that can match the value offered by the Sun Tracker Party Barge 18 Signature Series. Loaded top to bottom with features found only in more expensive pontoons, this compact model offers Mercury power, padded aft sundeck and lounge, full-instrumentation console with AM/FM/CD with iPod connection, 36-quart cooler and storage, flip-flop double-wide seat convertible to dinette seating, aft-entry platform with ladder, tons of storage, removable table, even a Bimini top. Plus, quality features like oversized 24" all-welded pontoons, all-aluminum box-beam transom with extended motor pod and built-in fuel tank may well make this the best nautical value on the planet.